The third edition of Business Today-YES Bank SME Survey & Awards received an overwhelming response. We present the inspiring stories of the four top winners. An Indian Institute of Technology (IIT), Delhi, graduate, Pramod Maheshwari gave up many job offers as well as his dream of working in the United States for his mother's sake. She was reluctant to let him leave his hometown Kota, Rajasthan, for work. Instead he turned entrepreneur, starting Career Point, a coaching centre for students aspiring to take the joint entrance examination (JEE) for the IITs and some other engineering institutes. He held his first classes in his father's tyre godown. Today, Career Point, with revenues of Rs 79 crore in 2010/11, is among the most highly regarded coaching institutes for engineering colleges in a town that has become the nerve centre of such institutes. There are company-owned and franchisee-owned Career Point centres in 10 other states, and together they coach 30,000 aspirants a year. "The fact that I had been at IIT myself helped me immensely," says Maheshwari. "In 1993, the year I started, I had 51 students, which rose to 200 the following year." With 51 of these 200 gaining admission into the IITs, Career Point's reputation soared. (The overall success rate at the IIT-JEE is less than three per cent.) Career Point has taken several measures to maintain a high quality of teaching at all its centres. A standard operating procedure has been laid down for all centres, which includes using uniform teaching methods and one-to-one counselling of every aspirant. It has also recently begun a programme called CPLive in which teachers from the Kota centre teach students at other centres using satellite communication. Maheshwari, 40, is also looking beyond coaching classes. He has already set up a school and is planning three more. Two private universities, in Kota and Hamirpur, Himachal Pradesh, and an engineering college at Rajsamand, Rajasthan, are also on the anvil. When he started out 20 years ago, Debtosh Chatterjee used to personally scour away stains in his clients' toilets, hoping to earn Rs 1,000 by the month-end. Today, as Managing Director and CEO of Chatterjee Cleaning Arts Services, a Kolkata-based facility management firm, he signs cheques worth many times that sum, including some related to the upkeep of his Mercedes C-Class. "My hard work has paid off," says Chatterjee. "It is very satisfying." When he started, he was his company's sole employee; today he has a staff of 6,500, with revenues of Rs 39 crore in 2010/11. His clients include top retailers, such as Aditya Birla Re t a i l , Pantaloons and Big Bazaar, as well as tycoons like Ness Wadia. Chatterjee, 40, does not see the likely entry of multinational companies into facility management as a threat. "MNCs will farm out contracts to smaller players like me," he says. "We also have a cost advantage, since we deliver directly to the client." He is currently busy setting up more companies, including one in Qatar. "I must go international," he says. Ever wondered where the fibre in some of those feather-soft pillows you use come from? They are the recycled remains of used plastic bottles. Ganesha Ecosphere was the first in the country to start making recycled polyester staple fibre - also called fibrefill or green fibre - from polyethylene terephthalate, better known as PET, a form of plastic. Starting modestly, with an installed capacity of 6,000 tonnes per annum (TPA), it overtook Reliance Industries in 2010 to become the largest such manufacturer, producing 57,600 TPA by recycling 60 lakh bottles a day at its two plants in Kanpur, Uttar Pradesh, and Rudrapur, Uttarakhand. Listed on the Bombay Stock Exchange, the company was set up by Shyam Sunder Sharma in 1994. Sharma had started a dyed and doubled yarn producing mill in Kanpur in 1989, but was keen to do something unconventional. "In the early days we neither had the technology nor the knowhow," says the 69-year old. But the situation improved after 1995, when he imported the required machinery from South Korea. "My comfort point is that while stocks of many other companies are getting devalued, this stock is able to maintain stability," says Poonam Garg, Senior Associate Vice President, IFCI Venture Capital Funds, which invested Rs 13.5 crore in Ganesha Ecosphere in April last year. After 30 years in the business, chemical engineer Shripad Madhavrao Khatav set up a consultancy, S.S. Techno Services, in Pune in 1997. Since then the company has moved on to manufacturing with much success, earning revenues of Rs 55 crore in 2010/11, with a net profit of Rs 3.9 crore. It makes evaporators and dryers: while earlier these were separate products, it now makes dryers only as part of evaporators. The products are designed by Khatav himself. Evaporators and dryers are used by numerous industries, especially dairy: evaporators remove water from milk, while dryers turn it into milk powder. Another set of key clients are tea companies. 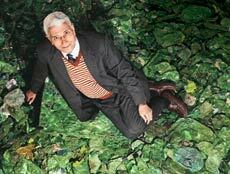 A few years ago, Khatav also decided to focus on the effluent treatment industry. "With the government making it mandatory for companies to treat their effluents, we are seeing good demand for our evaporator-dryers," he says. Clients include Kansai Nerolac Paints, Essar Steel and Pearl Distillery. With bigger companies such as Praj Industries and the Sweden-headquartered Alfa Laval as rivals, competition is strong. But Khatav has held his ground so far, even installing an evaporator each in Malaysia and the Philippines. He professes not to be worried by the current slowdown. "We have not been affected much because we are not very big," he says. The company has also developed a technology to automate production of jaggery, which it plans to commercialise this year.